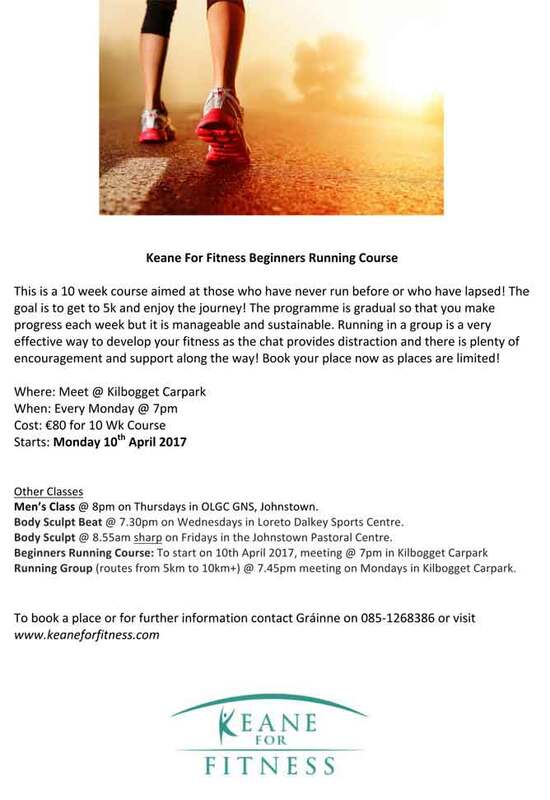 This is a 10 week course aimed at those who have never run before or who have lapsed! The goal is to get to 5k and enjoy the journey! The programme is gradual so that you make progress each week but it is manageable and sustainable. Running in a group is a very effective way to develop your fitness as the chat provides distraction and there is plenty of encouragement and support along the way! Book your place now as places are limited! Men’s Class @ 8pm on Thursdays in OLGC GNS, Johnstown. Body Sculpt Beat @ 7.30pm on Wednesdays in Loreto Dalkey Sports Centre. Body Sculpt @ 8.55am sharp on Fridays in the Johnstown Pastoral Centre. Running Group (routes from 5km to 10km+) @ 7.45pm meeting on Mondays in Kilbogget Carpark. This entry was posted in After School Classes and Clubs. Bookmark the permalink.